Japan entered the modern age in 1868, with a new young emperor determined to make his island nation a world power. After decades of steady progress, Japan began its own practice of colonialism, defeating China in 1894. As the Japanese began to infiltrate the semi-independent Kingdom of Korea, they ran into Russian agents doing the same. Despite Japanese offers to negotiate, the Russian Tsar Nicholas II was set on war. 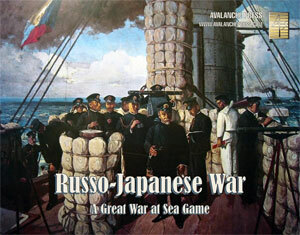 Russo-Japanese War covers the naval side of the Russo-Japanese War, which opened with a Japanese surprise attack on the Russian Pacific Fleet’s base at Port Arthur in northern China. There are 45 scenarios, including the climactic Battle of Tsushima. The Russian fleet is a mixed bag of modern battleships and ancient ironclads better suited for a museum. The Pacific Fleet that begins the game in the Far East has modern ships stationed at Port Arthur and a cruiser squadron in Vladivostok. Between them lies Korea, occupied by Japan. The Russian strategic situation is difficult. The Japanese have a better fleet; though not as large, their armored cruisers outclass their Russian counterparts and their torpedo boats are more numerous and more effective. They are also better-led after the death of the Russian Admiral Makarov. The map covers the Japanese home islands and the seas around them. As with other games in the series, it’s divided into zones 32 miles across. Fleets attempt to locate one another on this map. When contact is made, play moves to a tactical map where ships manuever and fight.